Lee Holdsworth is proud of his Preston Hire Racing team after a surprise fourth place finish in qualifying for this afternoon’s 120km race at Symmons Plains. The one-car team – a customer of Triple Eight – was established for the 2016 season and has managed to qualify on the second row in just its third race meeting of the year. 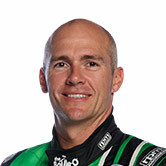 At a track where the Triple Eight cars has traditionally been strong, Holdsworth dialled a 51.27sec lap in his Holden Commodore in the 15-minute session, just 0.1170sec behind pole sitter Mark Winterbottom. “At this stage of the year I’m really proud of the team to be able to achieve that result, beating some of the bigger teams out there,” a happy Holdsworth told v8supercars.com. He was measured in his expectation for this afternoon’s race, hoping to hold onto a position in the top 10. “High hopes, yeah,” he said. “I think the aim for us is to be top 10 first and foremost – that’s a massive milestone for us for this year, at this point. The team’s tyre strategy was analysed on the television coverage and while Holdsworth was hesitant to give too much away, he said they were looking for a way to get more from green tyres. “Triple Eight have admitted to this problem as well, not getting enough of a green tyre gain, so we were just experimenting a bit with what we do to produce the grip,” he said. 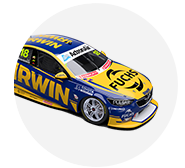 Holdsworth’s fourth place qualifying result placed him behind Triple Eight drivers Craig Lowndes and Shane van Gisbergen, and one spot ahead of Will Davison, who also runs a T8 car as part of the TEKNO team. Six-time champ Jamie Whincup was in seventh after the session but only 0.25sec off the pole time. “[Looking] at the results last year, we came here thinking we won’t be too far away,” Holdsworth said. “We’ve got a base setup from Triple Eight and hopefully we won’t have to go too far away from that to find the sweet spot and we didn’t have to veer too far from it, we just went down a direction helping us every time we get on track.